Artist's illustration of China's robotic Tianzhou-1 freighter docking with the Tiangong-2 space lab on April 22, 2017. 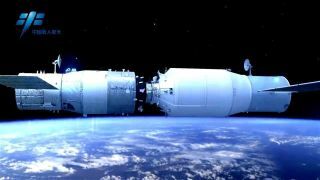 China's Tiangong-2 space lab and Tianzhou-1 vehicle have completed a second refueling test, Chinese space officials said. This second robotic refueling trial wrapped up Thursday (June 15) after about two days "and cemented technical results from the first refueling," according to China’s state-run Xinhua news agency. During its two-month flight in space, Tianzhou-1 is scheduled to refuel the space lab three times, China's CCTV-Plus has reported. Each test is scheduled to demonstrate a different aspect of China's approach to space refueling. The refueling procedure requires 29 steps to complete and lasts for several days each time. In-orbit refueling has been deemed as a major need by Chinese space officials to further the nation's space-station plans. China aims to have a multi-module complex up and running in Earth orbit by the mid-2020s. On Sept. 15, 2016, China launched its uncrewed Tiangong-2 space lab to Earth orbit. Learn all about the spacecraft, which China views as a key step toward building a bona fide space station, in our full infographic here.